Transforming the studio into a time capsule of his own artistic practice, Miguel Andrade Valdez will present a selection of documentation materials related to his past and ongoing projects. Retracing the development of his practice and working methodologies within the socio-political contexts of Peru and Mexico, the artist will discuss his deep-seated interest in materiality, sculpture, space, and vernacular construction techniques as well as the role of monuments in our understanding of the public space. 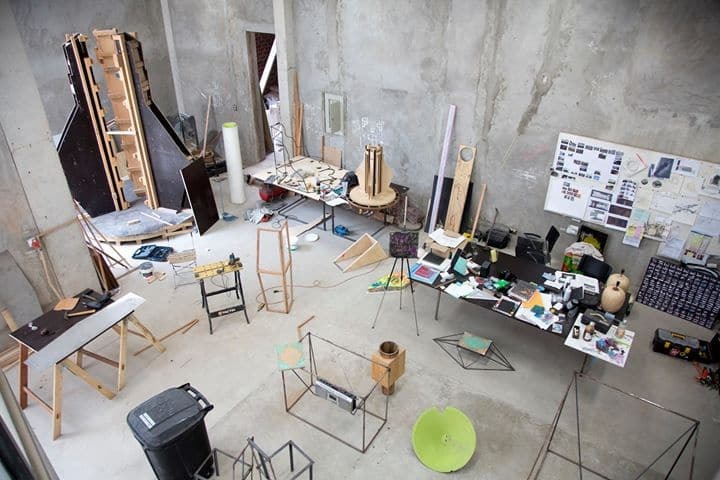 For this session, he will also present the documentation and leftover materials of an early performance he reenacted in the studio during the residency. The event will take place in the artist’s studio. Miguel Andrade Valdez (b. 1979, Peru) lives and works in Lima. His practice blends building methodologies and the language of sculpture in order to shape a different understanding of architectural construction and urban development. Through his large-scale sculptures and installations which take the human body as a standard unit of measurement, he casts built objects as representations of shared social spaces. His most recent solo shows include Estratos, MATE Museo Mario Testino, Lima, Peru (2016). He has also been included in numerous group shows including Zapopan Art Museum, Guadalajara, Mexico (2017); Mana Contemporary, Jersey City, United States (2015); Museo Mario Testino, Lima, Peru (2014); Museum of Contemporary Art, Lima, Peru (2013); and Art Basel Miami Beach, United States (2012).